Antonio Lucio Vivaldi (1678 – 1741), nicknamed il Prete Rosso ("The Red Priest") because of his red hair, was an Italian Baroque composer, Catholic priest, and virtuoso violinist, born in Venice. Recognized as one of the greatest Baroque composers, his influence during his lifetime was widespread over Europe. 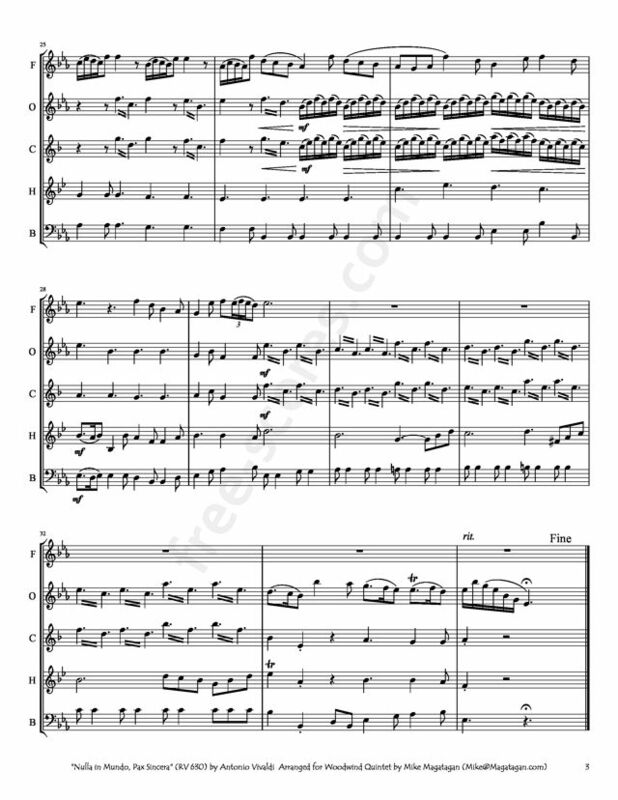 Vivaldi is known mainly for composing instrumental concertos, especially for the violin, as well as sacred choral works and over forty operas. 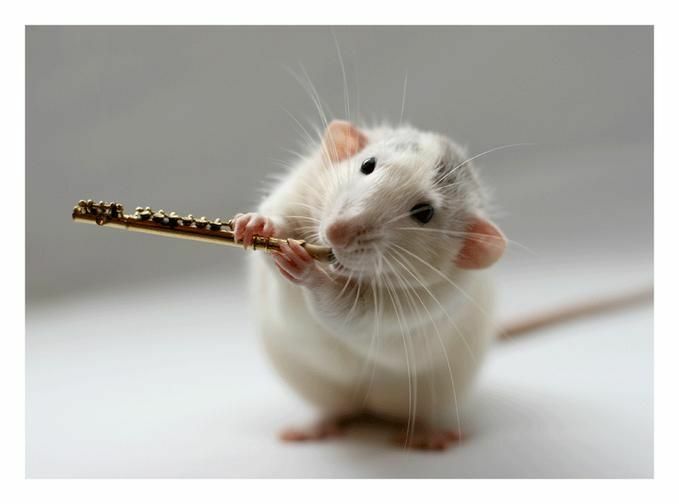 His best known work is a series of violin concertos known as The Four Seasons. "Nulla in mundo, pax sincera" (RV 630) is a sacred motet composed by Antonio Vivaldi to an anonymous Latin text, the title of which may be translated as "In this world there is no honest peace" or "There is no true peace in this world without bitterness". 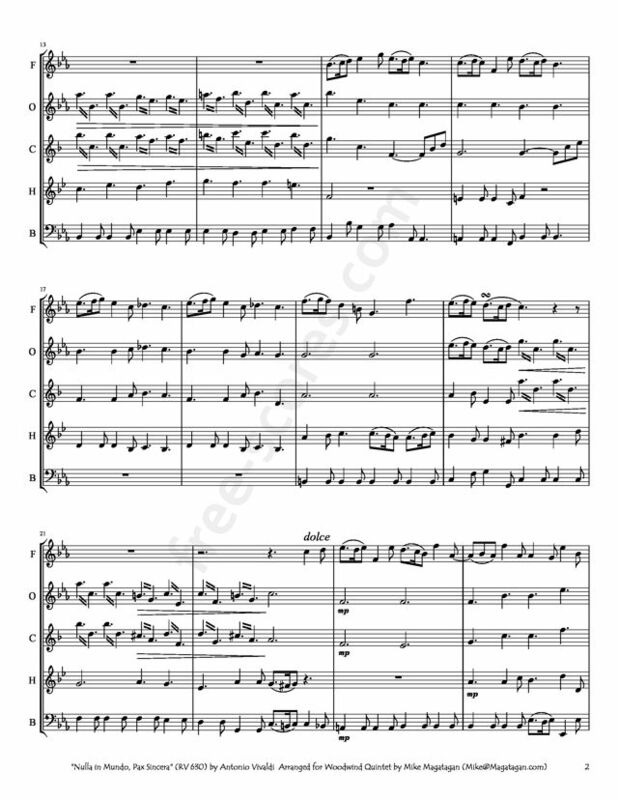 Written in the key of E major and in the typical lyrical Italian Baroque style, it is scored for solo soprano, two violins, viola and basso continuo, this would normally be a cello and keyboard instrument, in Vivaldi's case often the organ. The text dwells on the imperfections of a world full of evil and sin, and praises Jesus for the salvation he offers from it. It is considered to be one of Vivaldi's most beautiful solo motets. 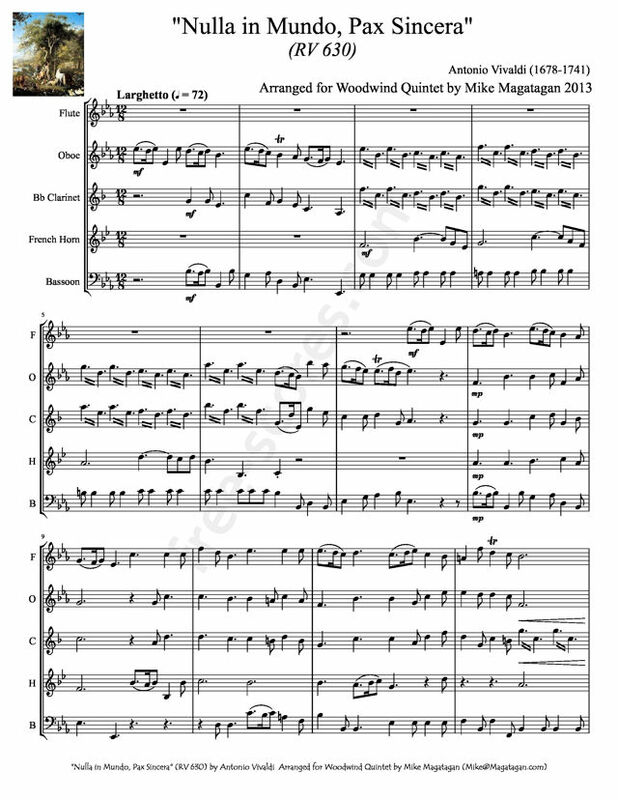 Although originally written for Chorus and Chamber Orchestra, I created this arrangement for Woodwind Quintet (Flute, Oboe, Bb Clarinet, French Horn & Bassoon).